When Ted (Ted Heasley RIP) and I visited the Isle of Whithorn back in 2000 AD the Cairn of Witness was new. We liked the idea but we hadn't known about it, otherwise we would have brought a piece of East Anglian flint to place on the pile! In 20015 it was still on my to do list. 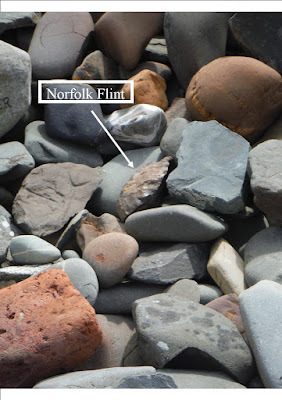 So last month when I returned, a piece of Norfolk flint was added and I had a minute or two remembering Ted. Back then we were on our way to Headford in County Galway - a pilgrimage made in honour of St. Fursey - it all seemed cut and dried. But now scholars find it hard to agree on where St. Fursey had his monastic formation. It may have been just a short hop across the Irish Sea in Ulster. Ted and I had called in at Whithorn where we visited the site of St. Ninian's , Candida Casa (White Shining perhaps? House ) the pilgrimage chapel at the Isle of Whithorn and Ninian's Cave. In my mind it had been a detour but now I see differently. I particularly like this photo taken in the Spring of 2008 in Cyprus. It illustrates the Parable of the Mustard Seed (Mark 4.31) and the Allegory of the Vine (John 15). The brilliant yellow of the mustard flower is every where in the spring - on field edges, in gardens, on little bits of waste land in Cyprus and Galilee. The mustard seed does not grow into a great tree where the birds of the tree make their nests. Everyone knows that! It was too windy to go out to the Farne Islands on Wednesday last week so I walked from Bamburgh around the coast to Budle Bay then back by way of the Spindle Stone. I could not help looking back at the castle and realising how close it was to the Inner Farnes . It was then I got cross with Cuthbert! He had his hermitage on the Inner Farnes. 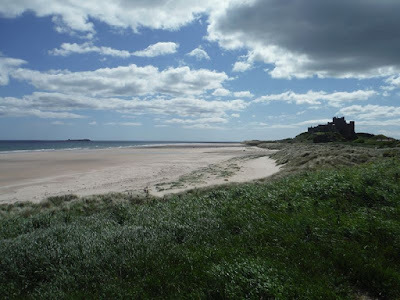 The king lived at Bamburgh Castle. It is one thing feeling you have a vocation to be a hermit. Its another to go grand standing about it. "Look at me I'm a holy hermit living on next to nothing in the middle of the sea?" By the time I'd walked the circuit I'd come to terms with what he had done. I realised I thought nothing in mounting the steps of a pulpit and preaching in the name of Father, Son and Holy Spirit. Cuthbert's enacted example was far more costly and communicated deep and uncomfortable truths that are still resonate.